Conspiracy Theories Are Not Entertainment - The Nation. A conspiracy theory is an explanation of an event or situation that invokes a conspiracy without warrant, generally one involving an illegal or harmful act carried out by government or other powerful actors. Conspiracy theories often produce hypotheses that contradict the prevailing understanding of history or simple facts. The term is a derogatory one. 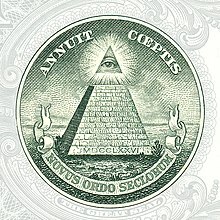 The Eye of Providence, or the all-seeing eye of God, seen here on the US $1 bill, has been taken by some to be evidence of a conspiracy involving the founders of the United States and the Illuminati.